The choice of the correct CBN grinding wheel must be determined according to the customer’s specific application. The decisive factor is the optimum interaction between wheel dimensions, grain size, bond and concentration. Our employees with their many years of experience will be pleased to advise you by telephone or at your site regarding a high-quality and cost-effective design of a CBN grinding wheel for your process. More than half of all grinding tasks can be accomplished with synthetic resin bonded CBN grinding wheels. The synthetic resin bond offers countless bond variations and very high stock removal rates. More than half of all grinding tasks can be accomplished with synthetic resin bonded CBN grinding wheels. Synthetic resin bonded metal bonds are characterised by very high grain retention forces. For the continuous self-sharpening of truncated CBN tips, large infeed forces are required, which produce increased heat generation. Metal bonds should therefore always be used for wet grinding. Dry grinding is possible with small contact surfaces and low cutting depth. (Profile grinding on PETEWE, Studer, Hommel and Loewe). Numerous bond variants and very high stock removal rates are possible. With electroplated nickel bonding, usually only one grain layer CBN is held (2- or 3-layer is conditionally possible). A special field of application for the S-bond with CBN as abrasive is the grinding of profiles in turbine construction. These bindings are characterized by porosity and profilability. The basis for the concentration specification is the value C100, which corresponds exactly to 25% by volume of pure CBN in the abrasive coating. The concentration determines the price on the one hand and the overall grinding behaviour of the disc on the other hand. 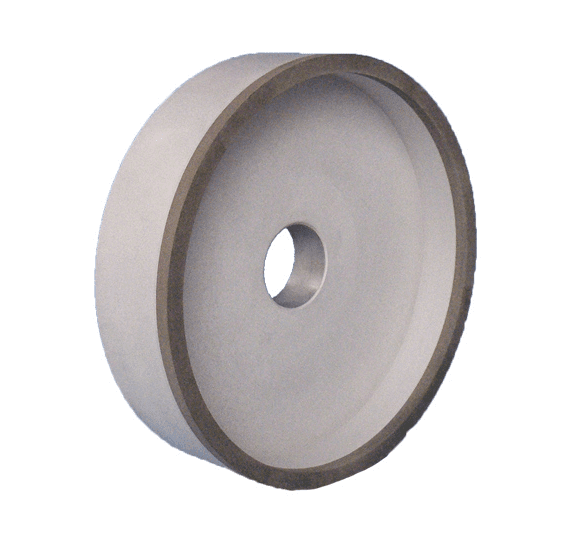 Higher concentrations (C100-C125-C150 / V240-V360) are appropriate when high profile retention, narrow covering widths, high bond hardness and deep grinding are required. Medium concentrations (C50-C75 / V120-V180) are recommended for cup wheels and peripheral wheels with larger lining widths and finer grain sizes. Low concentrations (C38-C50 / V120) are primarily used for very fine grain sizes. The selection of CBN grain sizes is decisive for the stock removal rate and the resulting cutting results and surface qualities. The service life of the abrasive tool is also influenced by the abrasive grain size. Due to the large selection of synthetically produced abrasive grains in combination with the different bond types, the quality of the abrasive tool can be optimally adapted to your grinding operation. For synthetic resin bonded abrasive tools, nickel coated abrasive grains are mainly used. Special coating processes enable adhesion possibilities in the bond, which also improve the thermal conductivity (see table of grit sizes below). In order to meet the various grinding requirements, there are a large number of grain sizes which have been combined into one standard by the FEPA (Fédération Européene des Fabricants de Produits Abrasifs). The same grain sizes apply to diamond and CBN. Diamond grains are identified by a D (e.g. D126), CBN grains by a B (e.g. B126). The grain size determines both the stock removal rate of CBN grinding wheels and the surface quality that can be achieved on the workpiece. The higher stock removal rate is generally achieved with coarser grit sizes. Finer grits improve the grinding quality, but at the same time reduce the stock removal rate.